CIRCLE Entertainment and the Nintendo 3DS eShop go hand in hand. Boasting nearly 50 titles with its name attached as either a publisher or developer, seeing a CIRCLE game pop up on the eShop update list has become the norm. With so many to its name, it's no surprise that CIRCLE's games run the gamut from top-notch to downright terrible. 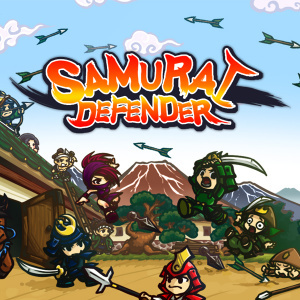 Its latest effort on Nintendo's portable powerhouse is Samurai Defender, a tower defense strategy game that sits squarely in the middle. Originally released as a mobile game, Samurai Defender slaps a cute art style onto Japanese history and turns it into a passable strategy game. Though taking place during the Warring States period in Japan, the plot doesn't delve deep at all, leaving it mostly as a way to introduce the setting and not much else. Additional background would have been helpful for identifying the armies that you're fending off, or for a bit of a history lesson, but we're instead left accepting very little context. 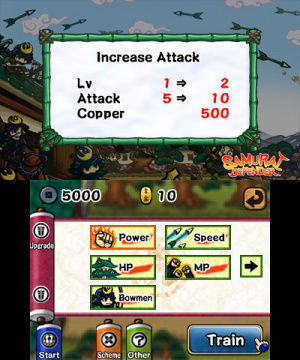 The plot sets up the game's theme and puts the action into motion while leaving the rest up to the player's imagination. Like so many tower defense games that came before it, your aim here is to protect your castle from oncoming hordes of enemies. Your basic attacking unit is an archer perched on your castle walls who automatically fires forward without discretion. Enemies follow a linear path directly towards you, but you can change the trajectory of your arrows using the 3DS console's stylus and touchscreen to land a more direct hit. As you work your way through the campaign you will be able to unlock additional archers and special attacks, all of which contribute to the limited amount of strategy that can be put into the combat. The way this game functions is by building off of itself. The playing field never changes, but the peripheral elements progressively alter to give the illusion of variation. With each passing stage stronger enemy units are introduced and the attacking armies increase in number. Because of this lack of change, there isn't much room for strategy that extends beyond directly attacking the oncoming forces. There are different special attacks and units that you can unlock and upgrade with treasure earned in battle, but there are no type advantages that truly make it strategically interesting. The singular strategy here is to get stronger and faster in order to do away with the baddies as efficiently as possible. The lack of true strategy in the gameplay also means that any difficulty found here is disingenuous; rather than each stage being more difficult, they're just progressively more inconvenient. 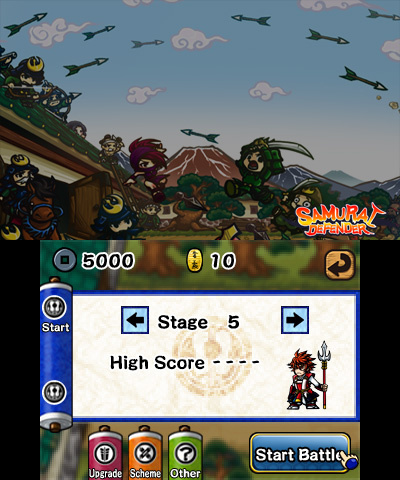 Some stages will fly by, but you'll also find yourself occasionally hitting stages that you simply can't beat due to the increased number of enemies. There's no strategy that works to compensate for this, so what you'll end up having to do is replay past stages over and over again to earn the funds to upgrade your troops. Past stages can go by rather quickly, and some reward you with a decent enough amount of treasure, but grinding through completed stages is inevitable, and it can get old very quickly. There are 50 stages in total with 10 boss battles dispersed throughout. When all is said and done, the campaign can be completed – grinding included – in just around five hours; upon completion a Boss Rush mode and hard difficulty setting are unlocked. Both of these do well to extend Samurai Defender's life for those obsessed enough to keep going, but it's really more of the same that you've already experienced. The gameplay remains unchanged making these extra modes, making them little more than an additional grind. Everything is intuitively controlled using the 3DS's touchscreen. 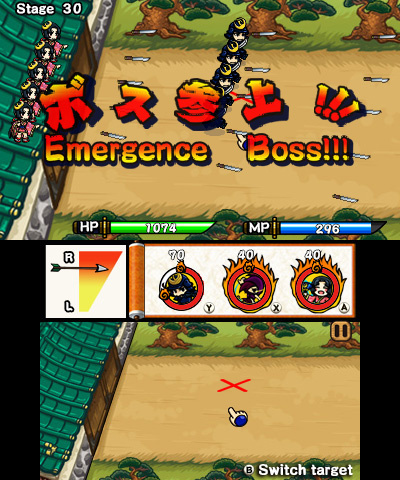 Though the action takes place on the top screen, the disconnect between the inputs and the action works well, leaving the battlefield clear of blockage from your hand. 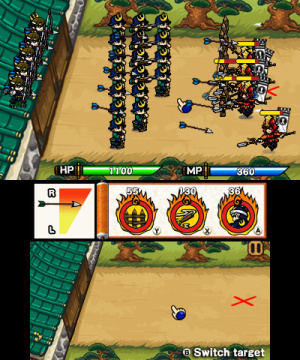 Special attacks are also activated via the touchscreen, employing a drag-and-drop system that allows you to specifically place extra units exactly where you want them on the field. Aside from the touch controls, there is also a physical input that corresponds to everything, such as aiming your arrows with the Circle Pad and selecting specials with the Y, X, or A buttons. This control method is far less natural, however, slowing down the action and making it difficult to make quick movements with precision. The art style isn't too original, but it is attractive and works well here. The characters and environment are bright and colourful, adding a cartoony flair to what would be an otherwise gruesome undertaking. Though attractive, it's disappointing to see that more wasn't done with the visuals. Nothing really changes from stage to stage beyond enemy armour, and the console's 3D effect isn't used at all. The frame rate also does some slight chugging when the screen is flooded with baddies, but it's not enough to call game breaking, just unpleasant. Couple this with the soundtrack that loops the same song in each stage and you're left with a package that could have been so much more appealing if a little more care had be placed into its design. 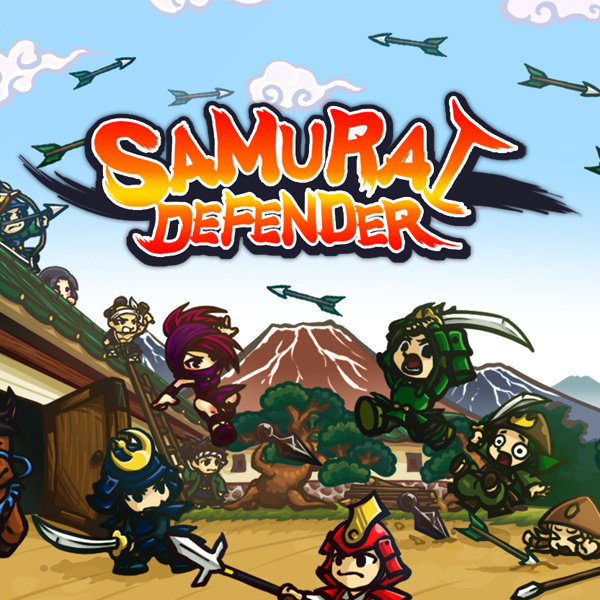 Samurai Defender is a truly basic tower defense game that blends right into its genre. While it does provide some entertainment, it doesn't do enough to keep itself interesting for any significant amount of time. The controls work fine, the art style is attractive, and the gameplay functions, but there isn't enough substance here to keep gamers occupied beyond the minimum. This might be good if you're looking for a quick tower defense fix, but there's little else to it. Sounds like a good sale game to me. @larry_koopa The creators of this game must have been fans of the game. I really liked Bookstore Dream and Publisher Dream, those were DSi games that released late in the cycle and tapped into a pretty big hole in terms of simulation style games on the 3DS. It's too bad neither got 3DS sequels. Really confused on how a journalist for a Nintendo fan site could possibly confuse Samurai as Chinese... more than once. Anyhow, as for the actual game, I've never been a fan of tower defense games, and I doubt a decidedly average entry in the genre would have won me over (even if it has a cool theme), so I'll pass. The Warring States period is generally used to refer to China. There was the Sengoku Period in Japan that was named similarly, but use of the term generally means you're talking about China. As mentioned in the review, there is an almost complete lack of story in the game, so beyond what was mentioned in press notes, there was little to no information available. Sure, the use of samurai probably should have tipped me off, but this would be very far from the first time that video games have incorrectly appropriated history or culture. tl;dr - I overlooked a silly mistake. It's not as huge of a deal as you're trying to make it seem, but I changed it anyway. Sorry!